In the quest to find the best décor for your house Ambesonne tapestries are the best gear you can wield. Beat the odds and find a perfect piece of furniture to complete your space. Finding a good tapestry online is a chore you can say goodbye to. Flexible and quality products can be used anywhere in the house. You will have living room tapestry, bedroom tapestry or kitchen one with one tapestry. Once you buy from us the question where to buy tapestries will be erased from your head forever. Handling the wall hanging is easy because it is not heavy so you can manage to hang them very easy. But do not let the weight of the tapestry fool you. What you get is a very durable product that will not fade rip or tear for a long time. Start your decoration journey with a single tapestry. Simplify the endeavor of choosing something to go with your décor with Ambesonne online tapestry store. Find an excellent tapestry with a quality fabric and well-made print. With its %100 polyester silky satin material, you will be assured both durability and excellence. Highly unique designs of our products offer excellence for both decoration novices and experts. Crisp and vivid colors of our wall hangings will advance the already beautiful complexion of your house. If you can name it, we probably have it. Revolutionize the idea of home décor with our magnificent tapestry collection. Long lasting, effective and quality wall rugs are the only thing you will buy from us. 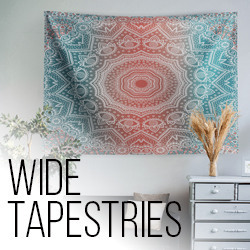 You will want to cover every empty space with our tapestries. Our flawlessly executed prints on the fabric will get you so many compliments that you will be addicted to it then surely come back to our store to get more. People around you will run out of ways to compliment your decoration choices. High definition, massive and vibrant images hook you and your friends up. Soon enough you will want to gift these beauties to someone else and make their life better. Choose a different style for every room. Make your bedroom an exciting yet serene jungle themed space. Then turn your living room into a traditional bohemian corner of far east Asia. Allow your spare room to be a winter wonderland. Change the kids' room into a cartoon filled super playroom. Transform your kitchen into a coffee shop or use them as décor pieces for your next themed party turn the tapestry into a mini photo studio the possibilities are endless. Let your creativity lead the way as you improve your life.